The Pope's Toilet functions as both a wild-eyed melodrama and a rather pointed anti-papal jab. Directors César Charlone and Enrique Fernández rely on an apposite bitterness for the emotional foundation of their film. And why not? 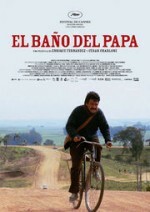 : There's nothing to suggest that this desperate, occasionally witty tale of a small-town Uruguayan smuggler and his get-rich-quick scheme—involving a pay toilet and Pope John Paul II's 1988 visit to the region—will end happily. César Troncoso delivers an engaging turn as Beto, a grasping, defeated little man who seems incapable of thinking beyond the next week, despite his airy ambitions. However, The Pope's Toilet calls out for a more appealing protagonist; Beto's venality only seems mild compared to the corrupt border official who bedevils him. More interesting than their clumsy characterization is Charlone and Fernández's ambivalence about the role of Catholicism in Uruguayan society. The pontiff's visit is little more than a financial opportunity for Beto and his fellow villagers, one that proves ultimately hollow. The Pope's Toilet asserts with a sharpness born of disillusionment that even the tangible blessings of Catholic faith are farcical, mere honeyed promises that do little to alleviate poverty.